Northern Mat and Bridge is excited to announce support towards local athlete and a fellow NMB employee, Maria Peterson. 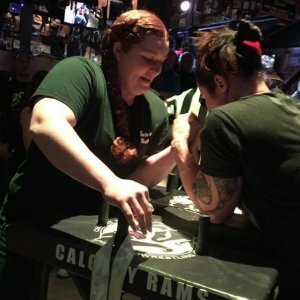 Maria, who is a full-time employee at our Rycroft Alberta mat manufacturing plant will be travelling to Laval Quebec from June 29th – July 1st representing Team Alberta at the 2018 Arm Wrestling National Championship! She’s no stranger to this tournament or level of competition as she is the 2x defending National Champion with her left arm and has a total of 3 National Championships to her name. She heads back to Quebec this summer to defend her title and we at Northern Mat and Bridge, couldn’t be more excited to support her journey! “It’s an honor to have Northern Mat and Bridge sponsoring my journey. My job is to thank them for my ever-increasing upper body strength. I’m just very grateful to be able to focus more on my training and less on trying to afford competition expenses” says Maria. Her path to provincial and national competitions has been relatively short as she only started competing competitively in 2015. Her first tournament in Grande Prairie (she came in as a walk-in with no competitive experience after hearing an ad on the radio) was a giant success, where she placed 2nd with both arms. 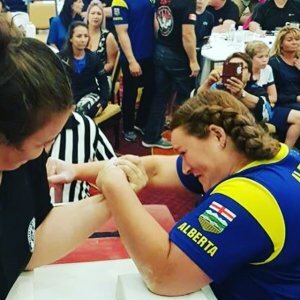 Fast forward a year and some dedicated training and travel, she again placed 2nd with both arms at Provincials getting her an invite to the 2016 National Championships, held in Saskatoon, Saskatchewan. This time, and in her first National event, she went undefeated with both arms to claim 2 National Championships! 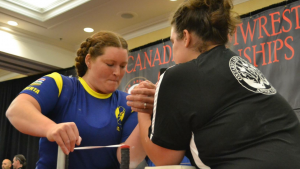 In 2017 while competing at the Nationals in Halifax, Nova Scotia she narrowly missed out on defending both of her championships placing 1st with her left arm and 2nd with her right arm. We at Northern Mat and Bridge are very excited to sponsor Maria on path to reclaim her National titles this summer in Quebec. You can follow her journey on Instagram at @ladycrunchynova, or on Twitter @takenobull.